Where I grew up, rain is a polarizing topic – either people loved the rain or they hated it. Some people would even use the rain as an excuse to put off doing the activities they love. However, we know that dealing with rain and inclement weather is just another part of maintaining an active life outdoors. Rain should not put a damper on you enjoying your favorite outdoor activities, and in the case of fly fishing, can even enhance your experience! Personally, I really enjoy fly fishing in the rain. Heavy rains can drastically change fish behavior patterns, and will require you to rethink your fishing technique, making your time out more challenging and more rewarding! While fly fishing can be extremely enjoyable in the rain, the threat of heavy rain can also make fly fishing somewhat dangerous. Thus, it is important to first take the right precautions before you go and while you’re out. But what are the right precautions? – Glad you asked! 1. In addition to your usual fly fishing gear, make sure you bring the proper equipment for fishing specifically in the rain. Collapsible wading staff – This will help stabilize you in the event of fast-paced rushing waters. We recommend a collapsible staff, as it is easier to carry on your belt. Waders (Wading pants) – While it is likely you already have a pair of these if you are an avid fly fisher, they become even more important in the case of rain. Make sure to get a pair that is breathable and antimicrobial to keep away mildew and block odor. Wading jacket – It is important to find a lightweight, breathable, and waterproof jacket. You’ll also want a jacket that allows for a wide range of motion, so you can cast properly and with ease. Wading boots – You’ll want something that is waterproof, offers good support and stability for wet and muddy terrain, and will keep invasive species from getting into your boots. Orvis has a great selection that we would recommend taking a look at! Space blanket – Lightweight, compact, and inexpensive these blankets are potentially lifesaving in case of emergency. They prevent hypothermia by reflecting your body heat back onto you in case of a fall into water. Headlamp – In case it rains so heavy that clarity begins to decrease, headlamps can help in lighting the area around you so you can get a good footing in and around the water and muddy banks. 2. Make sure someone knows where you’ll be heading (this is a good practice to implement into your outdoor activities anyway). 3. Make sure to bring survival gear such as a compass and extra supplies, should there be heavy rain. Watch where you’re walking! In heavy rains, gravel and dirt banks can turn into opportunities for a mudslide to occur. Take note of the strength of the water before you enter a river. After heavy rain, the river may be fast enough to take you off your feet. Wading staffs come in very handy here. In the case of winds, make sure your jacket is both windproof and waterproof. Once you’ve taken note of these safety measures, it’s time to focus on technique. Surprisingly, the rain can have a very strong effect on how you approach your fly fishing techniques. First, it is important to remember that not all rains are the same: we’ve grouped the different types of rain you might encounter into light rain, moderate rain, and heavy rain. Light rain is when the rain occurs in short bursts, or there are moderately moist conditions. 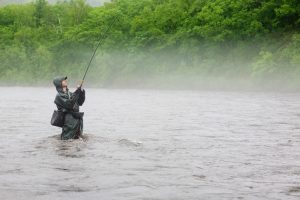 It is recommended that you stick to your usual fishing techniques, as neither the river conditions nor fish behavior will change in this type of weather. Moderate rain is when it has been raining for multiple hours, or has been raining very strongly for a shorter amount of time. In moderate rain, fish will begin to stay below the surface, making dry flies ineffective. This is the time to break out lead and rubber legs, appealing to fish that begin to hide near logs, rocks, or shrubs. Heavy rain occurs when it has been pouring all day, and there is a noticeable rise to water levels or murkiness of the water. While fishing in heavy rain, it is important to remember the safety precautions, and gravitate toward using streamers and flashes. It is also important to take note of wind, and adjust your casting technique accordingly. When fishing under normal circumstances, we would recommend a good 5-6 weight rod for maximum variability and light presentation. A rod like this would cause the fish not to be scared away, while allowing for fast hooking and good action. In the case of rain, however, the need for a delicate presentation goes away, as fish have to make quick decisions on whether or not they want to go for the fly. Thus, you can get away with 7 or even 8 weight rods and fly lines. While a risky move, this can increase your potential for landing a HUGE fish. In heavy rain, it is also recommended to use streamers, flash, and wooly buggers, taking advantage of the murky conditions in which fish will have impaired vision. If your fly fishing ends up taking you past sundown, we recommend checking out our Night Fishing Tips and Techniques post. Rain doesn’t have to put a damper on your plans to go fly fishing. 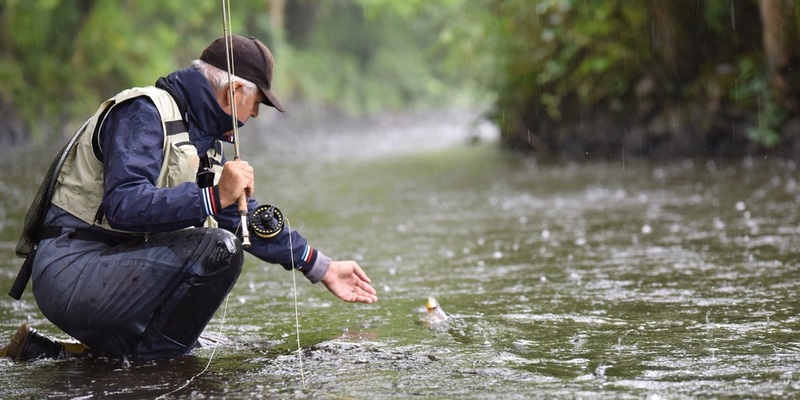 Instead, you can use the rain to your advantage to make a big catch, or have an all-around unique experience in practicing different fly fishing techniques. We think you’ll have a lot of fun fishing in the rain, and we’re excited to see what you think! Thanks for the tips for fly fishing. I have always wanted to learn how to fly fish better. I appreciate you mentioning that you should find a lightweight wading jacket so you can have the full range of motion you need. That will keep you dry, and allow you to fish your best. I will look into it. Your tip to consider the strength of a river after a rain seems really important. I think safety ought to be the first priority for anyone fly fishing, and the current of a river isn’t something to underestimate. I’ll be sure to keep this in mind if I’m ever caught in the rain fly fishing.